Get healthy and make the most of fresh ingredients with a Kenwood blender. Whether you’re whipping up a smoothie or blitzing up fresh veg for a delicious soup, Kenwood blenders get the job done quickly and efficiently. 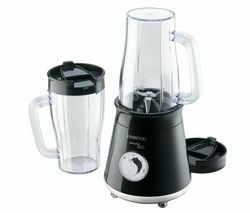 Any of our Kenwood blenders is sure to become an invaluable kitchen staple you’ll find yourself turning to all the time. To really embrace blending it’s important to have a machine that’s up to the job. For instance, if you’re blending hot and cold ingredients you’ll need a blender that stands up to a wide range of temperatures - look no further than our range of Kenwood blenders! Featuring a 1.5 litre Thermoresist glass jug, the BLP600WH lets you whizz up hot and frozen ingredients without the risk of thermal cracks or damage. The popular BLP600WH matches thermal versatility with serious blending power, courtesy of an 800 W motor that delivers variable speeds with a pulse function. By simply changing the speed you’ll be able to blend food to the perfect consistency, giving you greater control over your culinary creations. Kenwood’s expertly designed MultiZone blades complete a brilliant bending solution, ensuring food comes into more contact with blades, for optimised, chunk-free results. 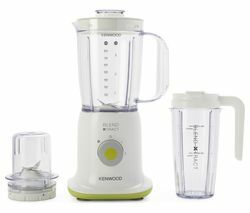 Our collection of Kenwood blenders also includes the SB056 Smoothie 2GO Smoothie Maker, a compact, stylish kitchen must-have that will have you whipping up delicious and nutritious smoothies in no time. Browse our complete collection of Kenwood juicers and blenders and see our Kitchenaid blenders range to explore a huge variety of mean machines and find your ideal blending buddy.